A woodworking machine that cuts mortise slots in timber using a hollow square chisel with a drill bit inside it. The main part of the mortiser, the hollow chisel and the bit that goes in it. Photo thanks to silentC and Wikipedia. 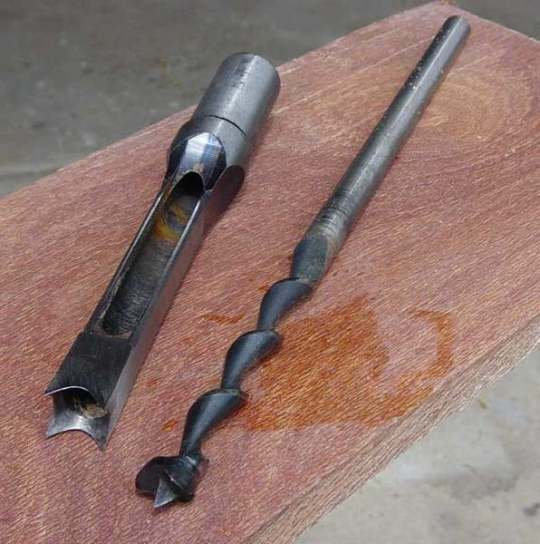 Now I know I am a bit long in the tooth and and we certainly had some old machine tools to work with "when I were a lad", but I can't say that they were as old as the ball-breaker on the right. I am not to sure if it would be classed as a machine at all. This was seen at the old Naval Dockyard at Plymouth, England. 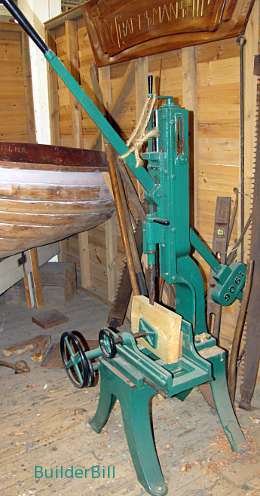 What I can say is that our old chisel mortiser was very similar in the body with the long handle and counterweight and the clamping and wheel adjustments. What ours had was an electric motor over the chisel, which was like the one above. Ralf and Robert Greenlee invented this tool in 1874 and it certainly changed things for the better. Quick in operation and it can produce very precise work. Note: Through mortises are never cut straight through in one hit. That would cause splintering on the bottom. They are always cut part way, and then the stock is turned over and the cut finished. Quick tip: Always mark the face side and face edge of the timber being worked. On the machine get in the habit of keeping the face side of each component to the machine fence to get consistent results.